If in West Java there is tourist destination of Green Canyon that make tourists feel fascinated, then in East Java, precisely in Bojonegoro District there is similar tourist destination. 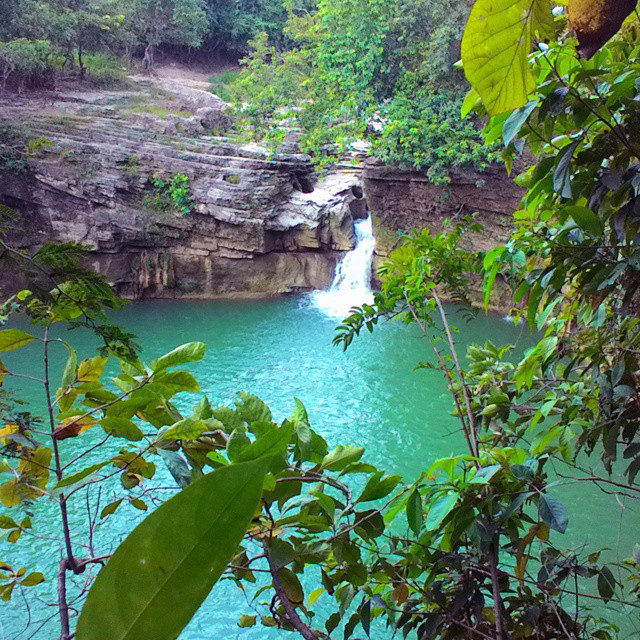 Kedung Maor Waterfall is one of the natural tourism that presents the hidden charm of Bojonegoro. Traveler might think if Bojonegoro is a barren, dry and hot region, well the point is far from the word beautiful! Make no mistake, that assumption is not entirely true. If you visit Kedung Maor, then the wrong assumption about Bojonegoro is immediately vanished. This is because the beautiful spots that offered Kedung Maor can make you "chuckle in awe". The typical limestone rocks with a fibrous rock motif produce a masterpiece of nature that can not be matched by the creation of a human's hand. High-art rocky rocks full of high art around the waterfall area add to the perfectness of Kedung Maor. Kedung Maor Waterfall is located in Kedung Sumber Village, Temayang District, Bojonegro District. The beautiful spot location of Kedung Maor is located right in the middle of the forest belonging to Perhutani of Bojonegoro. Kedung Maor is still very natural because it is rarely touched by people. Kedung Maor is a waterfall that comes from the flow of Kali Soko and water overflow is from the Pacal Reservoir. In the rainy season, the roar of the waterfall can be heard up to the settlement residents. But during the dry season the water flow in Kedung Maor becomes shrinking, but still does not reduce the beauty of this place.